The Northern Adelaide Hills is an area of diverse landscapes and attractions; from Inglewood in the west to Tungkillo in the east; Kersbrook and Mt Crawford Forest in the north to Lobethal in the south. Wildlife and wine experience abound, and there are plenty of family-friendly activities on offer. Travel from Adelaide via Gorge Road, Lower North East Road, or North East Road - all incredibly scenic drives. Base yourself here for easy day trips across the Adelaide Hills, Barossa or to Mannum on the Murray River. If you come via North East Road, allow time in your itinerary for The Topiary Cafe in Tea Tree Gully, nestled in the incredible Newman's Nursery with a stunning wisteria arbour. Drop in for scones or a coffee, but make sure you book ahead for a meal or high tea experience! Housed in the historic Birdwood Mill, the National Motor Museum has a fleet of some 400 vintage and classic vehicles awaiting your inspection. But it's more just an excellent collection - it tells the story of Australia's love affair. Motoring memorabilia in the collection includes brochures and maps, tin signs, petrol bowsers, toys, models and photographs. The National Motor Museum's iconic events - Bay to Birdwood in September and Rock and Roll Rendezvous in April - feature fabulous vehicles, live music, fashion and family fun. 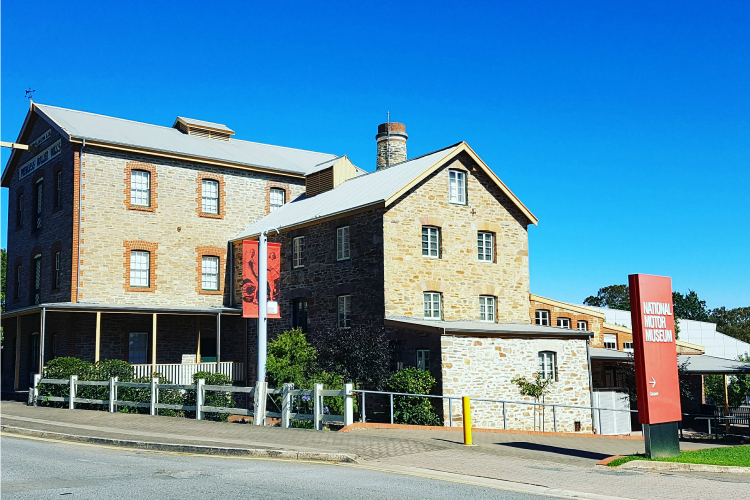 While in Birdwood, pop in to Treasures on Torrens if you love antiques and vintage wares, and Top of the Torrens Gallery for changing exhibitions of work by local artists. Birdwood Motel is a new property located right next to the National Motor Museum with five extremely spacious rooms. At Gorge Wildlife Park you can expect a close encounter with the animals. The 14 acre property contains Australian native animals, including koalas, kangaroos and wombats, plus exotic species including monkeys, alligators, meerkats, otters and more. You’ll also see a vast range of birds, from Superb Fairy-wrens to ostriches. Koala holding sessions are held every day and this is included in the ticket price. 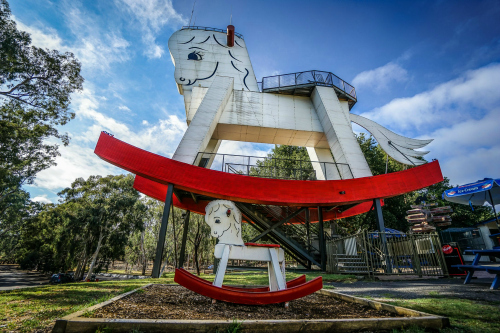 Visit The Big Rocking Horse and Toy Factory at Gumeracha to climb the giant rocking horse and interact with animals in the small wildlife park. The toy factory turns out quality wooden toys which are on sale in the shop along with an extensive range of other toys. Kersbrook Hill Wines & Cider in Kersbrook is a family-owned winery producing intensely flavoured small batch wines. However they are becoming increasingly well known for their premium basket-pressed apple cider, which is also made by hand using locally sourced apples from surrounding orchards. Visitors can sample wine and cider at their cellar door which is open seven days and also offers pizzas, regional platters, locally made treats and coffee. Look out for their acoustic music nights and afternoon sessions. Also in Kersbrook is Malclom Creek Wines (open by appointment) featuring a rustic stone cellar door surrounded by beautiful three-acre gardens with peaceful picnic spots and lovely views. In Mount Torrens, Lobethal Road Wines welcomes visitors to their mudbrick cellar door for tastings on weekends and public holidays. Get cosy by the wood fire in cooler months, or relax in the courtyard setting overlooking the vineyard. They are known for excellent regional platters and elegant cool-climate wines. Open Friday to Sunday and Public Holidays. Open by appointment, Paracombe Premium Wines in Paracombe has an incredible venue overlooking the vineyard. Paracombe Wines’ Sauvignon Blanc was selected as one of just three wines served at the recent prestigious ‘Sverigemiddag’ or Sweden Dinner, hosted at the Royal Palace in Stockholm. They also have for sale a selection of exquisite handmade jewellery made by Maasai women in Tanzania. Subscribe to their mailing list for details of cellar door events. 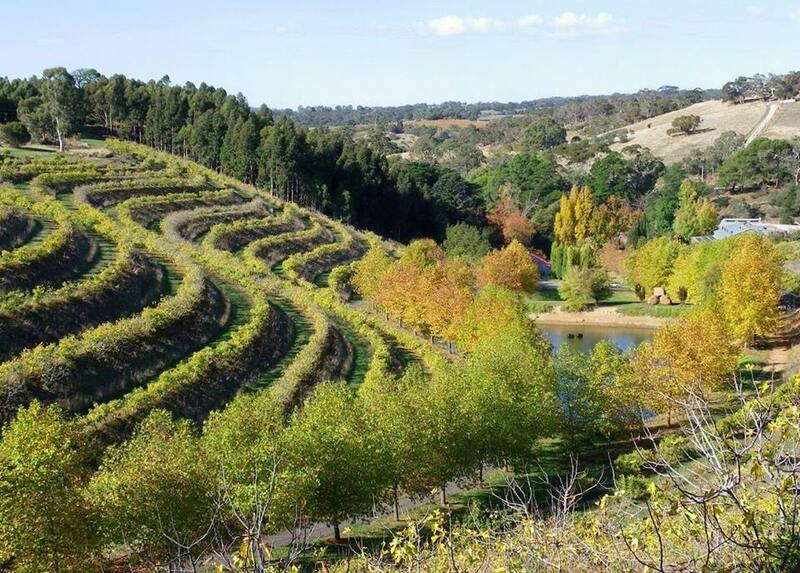 Mt Bera cellar door, restaurant and winery in Gumeracha showcases its boutique single vineyard wines with delicious local produce overlooking the Torrens Valley and also offers a vineyard cottage B&B (former site of Chain of Ponds Winery). Right next door, Talunga Estate is on a slight rise and offers wine tasting and platters with views over surrounding vineyards and manicured gardens. Open Friday to Monday and public holidays. Head to the old Gumeracha Cold Store to visit hip Unico Zelo winery and Applewood Distillery where you can try their wine, gin and other small batch spirits. Just out of Gumeracha, you'll find Protero Wines in Kenton Valley - housed in 'The Green Shed' where locals and visitors in the know head for organic fresh local produce, from fruit and vegetables to honey and eggs. For a full listing of cellar doors in the Adelaide Hills, see the Adelaide Hills Wine Region website. Established in 1843, heritage-listed Glen Ewin Estate is set in the picturesque valleys and rolling hills of Houghton. It’s hard to believe that such an expansive and beautiful estate is just 25 minutes north-east of Adelaide CBD. For more than a hundred years it was the home of Glen Ewin Jams. Today it features an excellent Bistro open for breakfast and lunch from Thursday to Sunday. Its regional Cellar Door offers tastings for a number of local wine producers without their own cellar door. From February to April the historic and beautiful terraced fig orchards are open to the public. You can pick your own or buy fresh pre-picked figs, along with many other Willabrand fig products and their superb fig gin! Paracombe Premium Perry in Paracombe uses tree-ripened local pears and apples to create fine handcrafted perry and apple cider using the best quality fruit, traditional processes and minimal human intervention. Tours and cider making classes are available by appointment. The Mount Crawford Forest Reserve covers an area of 12,367 hectares and is modelled as a community forest. It is managed for sustainable commercial forestry, while providing for the conservation of native flora and fauna and community use for recreation including camping. The extensive forest trail and road network is used by walkers, horse riders and cyclists. The forest is popular with mountain bikers as the Fox Creek / Cudlee Creek Sustainable Trail network (part of the Mawson Trail) provides the opportunity for a diversity of high quality off road riding experiences. The network has hosted range of national and local mountain bike, cross country, downhill and endurance races, and has developed a reputation as having some of the best trails in Australia. Take a seat and be part of an inspiring story! The Community Mosaic Couch Trail project brought together locals in bushfire affected communities in the Northern Adelaide Hills to make mosaic ‘patches’ that joined to form the ‘quilts’ that now adorn a trail of outdoor community couches. Check out the trail of these colourful community couches situated in Houghton, Kersbrook, Gumeracha, Cudlee Creek and Paracombe – works of art that are testament to the community spirit, collaboration and resilience of Adelaide Hills communities. The town of Mount Torrens is steeped in history. A stopping point for bullock teams travelling between Adelaide and the River Murray along with development of pastoral and rural industries in the 1840s provided the basis for the town. This is still evident from the substantial dwellings, many of them two storied, still in wonderful condition today. Visitors can follow the Heritage Trail - Townsend, Prescott, Thomas and Tuck Streets all feature impressive and interesting buildings which are described on interpretive plaques. The Old Coach House on Townsend Street displays numerous historic photographs and artefacts along with historically significant architectural drawings of some of the old buildings. The town is home to one of the stone sculptures that forms the Hills Sculpture Trail and is also situated at one end of the17-kilometre Amy Gillett Bikeway which is a bitumen track running to Oakbank popular with leisure cyclists, walkers and horse riders. In addition to wineries, a distillery and The Big Rocking Horse and The Toy Factory, Gumeracha is great spot for a picnic at Federation Park on the banks of the river. It is also home to the Gumeracha Country Market held on the third Sunday of each month and the Medieval Fair held annually in May. If you're visiting from November to January, visit a cherry orchard for shed door sales (Kersbrook, Forreston and Gumeracha) or to pick your own (Kersbrook and Forreston). Refer to the Cherries SA Cherry Map for full details.